When I found out I was pregnant with my first child, I was still a university student. I was elated and overjoyed with the news, but I also couldn’t help feeling apprehensive and anxious! I was extremely blessed; Allah had given me this gift to raise and nurture, but on the other hand I had doubts if I could actually handle the responsibilities of being a mother and a university student. How would I balance both roles? Could I continue my education or would I have to put it on hold? That was about 7 years ago, and I have good news to share: I was able to successfully complete my university degree about two years later. In fact, I had the honour of carrying my little girl in my arms at my graduation ceremony! Alhamdulillah, it was a day I will never forget! In this article, I will be sharing my tips that helped me get through my university studies as a mother with young children. In sha Allah, my advice will show you that education (whether secular or religious) does not have to be abandoned or given up when you have children. Whether you are a mother or mother-to-be who is thinking of becoming or already is a student, these tips are intended to help you find a balance between two important roles. This is the most important tip: make sure your child is in good hands! You must feel comfortable leaving your child in someone else’s care, otherwise the stress over childcare can negatively affect your performance at school. Start looking into childcare options as soon as you can, as some places have a long waiting list. If you are planning to leave your child with a family member, make sure you both are on the same page in terms of how your child should spend his or her day. Firstly, you will need the support of a family member that you can count on in the case of unplanned situations or late study nights, whether it is your spouse, a family member or close friend. Something to remember is to make sure that you remind that person of your appreciation for them; in the busyness of classes, studying and exams it can be easy to forget those who are there to make it easy for you. Secondly, keep in mind that professors can be accommodating to your situation, so tell them at the beginning of your family commitments and keep them informed of certain situations that come up. For instance, my daughter ended up in the emergency room for a night, and I was unable to attend class the next morning, as I came home just hours before class started and I was still trying to calm my baby. I informed my professor of my situation, and he was kind enough to give me an extension for my paper that was due that day. Additionally, having an honest relationship about your situation will help with the next tip. This may not be as easy if you have already started school, but would be particularly helpful to someone who is considering going back to education after having children. Would it be better for you to attend classes in the morning, so you have the rest of the day to work on your assignments, study and take care of your baby? Or would you prefer having evening classes so that you can spend some time with your child before you go to school? Furthermore, consider how much time you would like to have in between classes; for instance, would it be ideal to have an hour or more between each class, so that you can utilize this time for a quick review session before the next class starts? Or would you like back-to-back classes so it shortens your day and you can get home quicker? Find out what works best for you and your family, and schedule your classes as soon as possible so that you get the times and days you desire. Review your notes from class as soon as possible; this way the information learnt is still fresh in your head. Read the class notes or the textbook right beforehand, so you know what to expect and so that you can ask your professor any questions that you may have. Write down summary notes with key definitions highlighted; these will be handy if you don’t have time to read your full set of notes. Eat high-energy foods and engage in quick exercises to keep your brain and body stimulated during study time. Listen to your body! If you find yourself so tired that you can barely think straight, then taking a short nap will refresh your mind and brain, so that you can wake up and get back on track effectively. I learned this the hard way, as my biggest mistake was trying to complete my assignments with my baby around…a big no-no! My daughter was able to sense that I was not giving her my full, undivided attention, and as a result, she would get frustrated and start crying. When she wasn’t crying, she was trying to grab my papers and yank the pen out of my hand – we were both getting nowhere! I quickly learned that I needed to pay full attention to her and do my assignments when she was napping or sleeping during the evenings. Another suggestion is to wait until your spouse or a family member is able to take care of the baby, so that you can study in a room separate from your baby, or go to the library where there are less distractions. Moreover, make sure that you are spending quality time with your child when you are free, so that your child is getting enough attention and love from you at some time during the day. As a parent, you will want to find alternative solutions to certain issues that may arise. For example, you may not always be able to make it to group meetings outside of class due to your child being sick; this is why it’s a great idea to find alternative solutions where you can still be at home and caring for your child, but still be a part of the meeting. One way in which this is possible, is to ask your group members to have a conference call through Skype or Google Hangouts. Engaging in a conference call allows you to still participate in group discussions, while being at home attending to your child – it’s a win-win situation! Seeking knowledge is a great blessing from Allah and can be a source of barakah in our lives. Education is a means for us to gain wealth and support our families, but as always, our ultimate goal should be to please Allah . Seeking knowledge, whether spiritual or non-religious, is rewarded, especially if you combine multiple intentions. Lastly, don’t forget to keep making dua that Allah makes this journey easy for you – there will be some ups and downs, some frustrating times and some times where you feel like giving up! In sha Allah with patience and hard work, the fruits of your labour will be seen very soon! I leave you with a tip that you must remember at all times: don’t let the guilt get to you! There will be days where you will want to be with your baby instead of in the classroom, but know that you are doing this not only for yourself, but for your child as well. 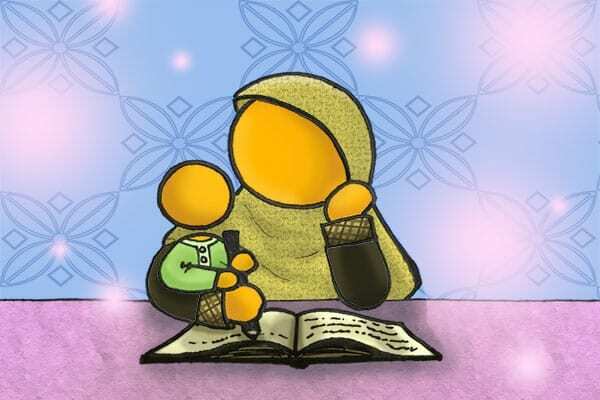 Your child should motivate you to complete your studies, and should push you to do your best! Don’t give up, keep going and make sincere dua that Allah makes it easy for you to accomplish your goals. Are you a mother who is studying or considering going back to education? What are your tips and experiences?